It’s nice to have some kind of pumpkin dessert out around Thanksgiving. Pumpkin pie may be the most popular, or at least the most prevalent, but it’s not the only way to enjoy the flavor of pumpkin. 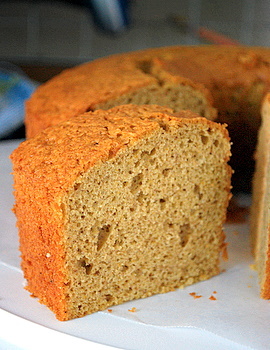 This pumpkin chiffon cake is one of my favorite alternatives to pumpkin pie. It is light and airy, as chiffon cakes get a lot of their lift from beaten egg whites folded into the batter, but it still has a great fall flavor to it because of the pumpkin puree and pumpkin pie spices included in the batter. Unlike angel food cake, which gets all of its leavening from beaten egg whites, many chiffon cakes include some baking powder or baking soda in their recipes. This extra leavening provides some leeway when constructing the cake, so the basic batter can be a little heavier and include very moist ingredients, such as pumpkin puree or mashed banana. The finished cake rises high and looks quite impressive, but it is actually very easy to make – and has an edge over pumpkin pie when you consider that you don’t need to make a crust as a first step! The cake, although it is airy, is still very moist. A small amount of vegetable oil, as well as several egg yolks, provide just enough fat to keep the cake tasting fresh even a couple of days after baking. This also makes it a good choice for a dessert that you can prepare in advance. The cake smells like a freshly-baked pumpkin pie and has a similar flavor, though the tender-spongy texture of the cake makes it seem much less intense than in a pumpkin pie. I prefer to serve this cake, and chiffon cakes in general, without any glazes or frostings so the lightness of the cake can really come through. I always serve it with coffee or tea, since it’s a great cake to dip in a hot cuppa. If you really want to put something out to accompany the cake, I would recommend either some lightly sweetened whipped cream or a sprinkle of powdered sugar. In a large mixing bowl, sift together cake flour, 1 1/3 cups sugar, baking powder, salt, cinnamon, ginger, allspice and nutmeg. Mix egg yolks, pumpkin puree, vegetable oil and vanilla extract together in a small bowl. Pour pumpkin mixture into flour mixture. Stir until mixture is well-combined and no streaks of flour remain. Set aside. In another large mixing bowl, beat egg whites until foamy. Beat in the additional 2 tbsp sugar, then continue to beat egg whites to soft peaks. Gently stir 1/3 of the egg whites into pumpkin mixture to lighten it up. Fold remaining egg whites into the pumpkin mixture until batter is uniform in color andÂ no streaks of white are visible. Pour batter into an ungreased, 10-inch tube pan. Gently tap the side of the pan once or twice to eliminate any large air pockets. Bake for about 50-55 minutes, until the top springs back when gently pressed. Invert pan over a wine bottle or cooling rack until completely cool, 3 hours or overnight. When cool, carefully separate the cake from the pan with a thin knife and invert onto a serving platter or cake stand. Mmmm…sounds delicious! I might have to go ahead & make this even though I’m the only one in the house who will eat it…which is not really a bad thing! The cake looks so deceiving – at first it looks quite dense, yet you say it’s so light. I have to give this one a try. I’m all for simplicity – why ruin a great flavour with icings and drizzles. i made this yesterday and it was great! i served it with a little dollop of cinnamon whipped cream, and i was pleased with the results. thanks!